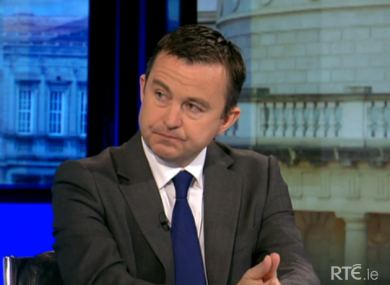 The junior minister said Reilly is the most suitable person to tackle the health budget. MINISTER OF STATE Brian Hayes has said he has “absolute confidence” in Health Minister James Reilly’s ability to deliver savings announced in the Budget last week. Reilly has come up against criticism in the last week over the cuts due to be implemented in the health budget and reports today suggest he is under increasing pressure from his colleagues in government over his management of the department. The €666 million budget adjustment included a review of medical cards with the aim of saving €113 million, while also confirming free GP care for all children under five. Speaking on RTÉ’s The Week in Politics, Hayes said he believed that Reilly was “the most suitable person” to take on the role of tackling the health budget and that the measures announced had been a “collective decision” in government. However Hayes was challenged by Fianna Fáil’s health spokesperson Billy Kelleher who said he didn’t believe Reilly was “capable” of ensuring that services would be provided to people in need. This was echoed by Sinn Féin’s Caoimhín Ó’Caoláin who said that if it was Hayes’s view that the minister was the most suitable for the job, “then this government are more poorly equipped for the task in front of them than we first realised”. On the issue of free GP care for under fives, Hayes said he was “proud” the government had managed to make the first steps towards universal healthcare in such a difficult climate. Kelleher, on the otherhand, dubbed it a “political stunt” to allow Labour to save face. The junior minister said that the “great majority of people will continue” to have medical cards but acknowledged that there are “always cases that will be highlighted” that do not fit in under the rules. Email “Hayes: I have absolute confidence in Minister Reilly's ability”. Feedback on “Hayes: I have absolute confidence in Minister Reilly's ability”.